The Roomba Wi-Fi Remote module enables you to do its network configuration easy and quick using any device or system with web browser, Wi-fi connectivity and capable to connects to an AdHoc network. The advanced configuration system of Roomba Wi-Fi Remote enables you to make mistakes during the Wi-fi parameters configuration: even the configuration is wrong and the module can’t establish the connection with your Router, Roomba Wi-fi Remote reconfigures itself with the default values and shows you the error on this embedded web server. 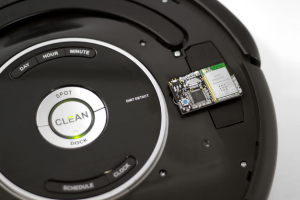 If you forget the IP address of your iRobot and don’t have any scanner software, Roomba Wi-fi Remote has a restore button that resets all connection parameters and enables you to retry the network configuration. 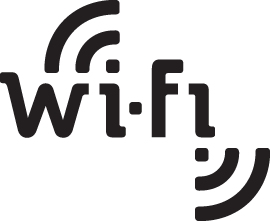 The module generates an AdHoc Wi-fi Network. You can connect with your Roomba Wi-fi Remote directly without any dependence of existing Wi-fi Networks around you. You only need your PC, MAC, iPhone or iPad to connect with the Roomba Wi-fi Remote AdHoc and reconfigure it to connect with the Wi-fi network of your home, laboratory, office, etc..
To get access to the embedded web server through the AdHoc connection, be sure that the module is connected correctly and the Led is blinking one time per second. You have your module configured with the SSID and Key of your Wi-fi Network. If this network has Internet access you will see the images contained in the Roomba Wifi Remote’s embedded web server. When you are configuring the network parameters you can configure your Roomba Wi-fi Remote with DHCP to provide automatically an IP address, Gateway and DNS servers from your inalambric router. In this case the Led is blinking every three seconds. When Roomba Wi-Fi Remote is trying to connect to the Wi-fi network it’s Led is blinking 3 times every second. This process may take 2 minutes depending of the DHCP configuration, the signal level of your Wi-fi and the retries if some parameter is wrong. If any error appears during the connection, the module will reset itself and will wait in the Hotspot Mode showing you the cause of error in the configuration page of the embedded web server. With this information you will be able to apply the correct configuration.